The Philadelphia Folk Festival has a longstanding history of celebrating the craftsmanship of traditional folk art. Our Craft Area offers products from an extraordinary collection of crafters and artisans who are painstakingly reviewed and selected to be a part of our Festival family. 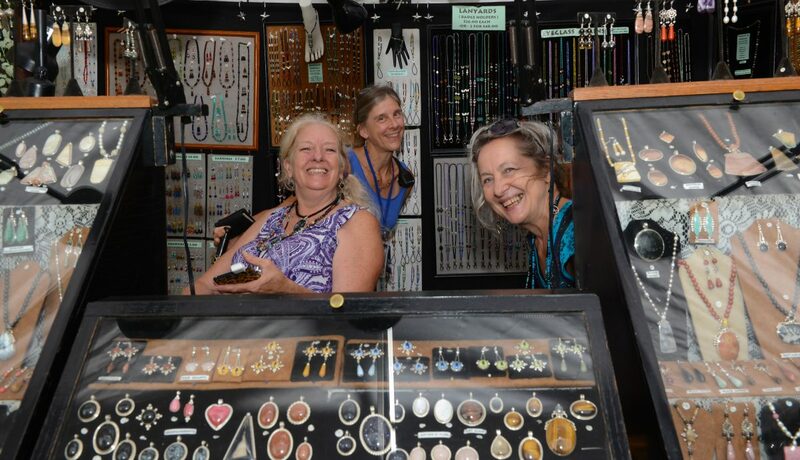 We also welcome several wonderful vendors who represent the best artisans from other countries. If you would like to join us as a Crafter or Vendor, please follow the link and fill out the application completely and submit. Please note that due to the quantity of applications we receive, deadlines are strictly enforced. Applications must be submitted on or before May 1, 2019. Please do not call to find out whether or not you have been chosen. Those who are accepted will be notified. • For Handcrafters, single booth $700; double booth $1,300. Artisans who demonstrate their craft can have a double booth for $700. • For Vendors, single booth is $850; double booth $1,600. Please note that this is an OUTDOOR, RAIN OR SHINE event that takes place on a working farm. Please be prepared with appropriate clothing for yourself and materials to protect your booth and your merchandise. CLICK HERE TO APPLY TO BE A CRAFTER! CRAFTS at The Philadelphia Folk Festival is a three-day, outdoor, juried show held as a part of our music festival. The jury meets each April to review the dozens and dozens of entries so that every August, we can host upwards of 40 handcrafters along with a small number of vendors who import goods. We welcome glass, metal, textile, jewelry, pottery, wood working, toys, and leather work. We have a beautiful 80-acre site where we come together to celebrate the end of summer with music, merriment, and most of all FUN! The single story spaces are 10×10 and include electric and WiFi. The fee is $700 per space for handcrafters, and $850 for vendors of imported goods. You may purchase two spaces. Please note that there are only a limited number of vendor spaces available. There are also a limited number of demonstration spaces available for handcrafters. These demonstration spaces are adjacent to your booth for demonstrating your art. These spaces are free of charge. If you would like to be considered for a demonstration space, please submit a short video. We would love to see what you do! You will need to bring (and be responsible for the set-up and appropriate maintenance of) your own tent/ booth, suitable for the weather of an August afternoon in Upper Salford Township, PA. Due to the weather fluctuations, please be prepared for any and all types of weather! CRAFTS is open from 11AM to 11PM on Friday and Saturday, and from 11AM to 9:30PM on Sunday. Your booth must be staffed all day. Our Crafts Committee volunteers will be available to you to “booth sit” for meal times and bathroom breaks, and will check in with you throughout business hours to provide change and water if needed. We offer Helper Badges, so please bring your friends and/or family to help you throughout the weekend! Helper Badges are passes to the festival, including the camping area. Each booth gets two crafter or vendor badges and three helper badges. We also offer weekend meal tickets at $25/person. This meal ticket provides access to our Volunteer Food Tent where delicious and nutritious food is served, including vegetarian options. There are also Food Vendors on site should you prefer other fare. CRAFTS parking is available directly adjacent to the CRAFTS and is located next to the Main Gate of the festival. Each crafter or vendor is entitled to one spot in our CRAFTS lot. Additional free parking is available in the staff lot, which is offsite, just down the road. Onsite parking passes may also be purchased from the festival. You are welcome to sleep in your vehicle in CRAFTS parking, but you may not set up a tent in this lot. Tents may be set up in the campgrounds, a short walk from the CRAFTS area. Please be advised that there are no RV hookups available. The campgrounds have water, port-o-lets, paid showers, an ATM, WiFi, and several food vendors serving late into the night. The site is a working farm for nine months of the year. So, the Folk Festival and its Volunteers encourage all to “Leave nothing but footprints” and hope that you will be a part of our commitment to keep the farm pristine and to remove all of your belongings and trash when it’s time to pack out. We do not offer refunds. We work hard to raise money for a cause near and dear to our hearts. The Philadelphia Folk Festival is the oldest, continuously run outdoor music festival in North America. Now in its 58th year, the Festival stands apart not only for its longevity, but for its unparalleled and unique community of spectacular artists from near and far, as well as our dedicated multi-generational attendees and volunteers. The Festival has earned a reputation for world-class programming, presenting both emerging artists and well-known talent. The Festival programs a diverse array of music, and actively seeks to broaden public interaction with folk music that resides outside of typical perceptions of the genre by being intentionally inclusive and encouraging cross-cultural exploration and discovery. Considered an international leader in Folk, in 2018, the Festival was the first in North America invited to join the Keychange Pledge, pledging to achieve 50/50 gender parity on AND off stage by 2020. The Festival achieved this goal in 2018, including earning distinction as the only major outdoor music festival in America to feature ALL women-led headliners. The Festival will continue its vision of equitably representing women, minorities, LGBTQ+, and cultures from around the world through its 58th year!